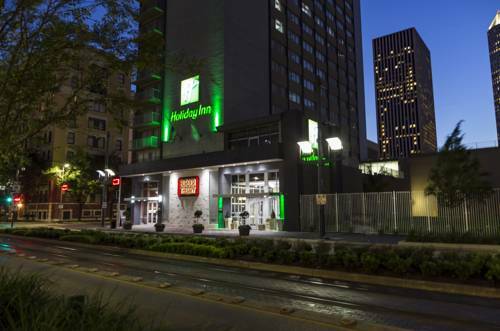 Welcome to the Holiday Inn Houston Downtown. Located between the heart of downtown and the excitement of Midtown. By day attend your business meetings and by night enjoy the many shops and entertainment venues within walking distance. Our ideal location is only minutes from Texas Medical Center, Exxon Mobil, Chevron, Deloitte, Accenture, Baker Hughes, Pricewaterhouse Coopers, KBR, JP Morgan Chase, Oracle, George R Brown Convention Center and AIG to name just a few. With Houstons Metrorail located across the street, getting to your destination is a breeze. Explore what Houston has to offer, we are minutes away from Houstons amazing attractions and events. Looking for a day of retail therapy? Try The Galleria or the Shops at Houston Center for world class shopping. Maybe you want to enjoy Houstons Green space? Herman Park and Discovery Green are a must do! If you are In town for a sporting event, the Toyota Center, BBVA Compass Stadium, Minute Maid Park, and the NRG stadium are close by. Take the family to the Houston Zoo or the Downtown Aquarium. Check out the Museum of Fine Arts, Alley theatre, Bayou Music Center and the Hobby Center for the Performing Arts. Enjoy gourmet burgers and various American fare at Burger Theory , our in house restaurant. Have a seat at the bar or grab a table with friends. Either way, you are sure to have a fantastic experience. Come and enjoy all that Houston has to offer. The Savoy Room will accomodate your small to medium size business meeting or catered event. Nine hole golf course, spread out over 3 1/2 acres of land, with practice facilities. Hermann Park Golf Course is the only course located in the downtown loop and is just a short distance from the hotel.